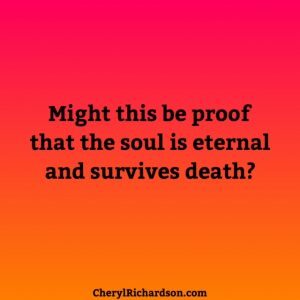 Week 13 – Might this be proof that the soul is eternal and survives death? This morning, I searched through my newsletter archives looking for a blog to repost. The last few months have been filled with a lot of loss for my family and me. After losing my dad in November, we lost my uncle (his brother), and now another uncle (my mom’s brother), this weekend. I came across a story I shared from our friends Bob and Melissa who host AfterLifeTV.com. It was exactly what I needed today – a comforting story about the eternal nature of the soul. “On Monday night we got a call informing us that our dear friend, David (who lived in England) had passed away from cancer early Saturday morning. David was 38 years old. David had emailed us a few months ago saying that he had a tumor in his leg removed, had gone through radiation, and was given the “all-clear” from his doctor. It was the last time we connected. A few weeks later, the cancer returned and, according to his wife Phoebe, his health failed quickly and he passed much sooner than anyone expected. Having learned of David’s death Monday night, Melissa talked with David in her mind most of the day on Tuesday, asking him for a sign that he was okay. Although we know from our work in this field that death is a doorway home and that our loved ones are always in a safe and loving place after their passing, it’s always nice to get confirmation. On her way home at the end of the day, Melissa stopped by a local sandwich shop. While waiting for the sandwiches to be made, Melissa was standing by the cash register when an employee suddenly picked something up from the counter and handed it to her. “Here, you want these?” said the girl. Melissa held the coins in her hand. “One for me and one for Bob,” she thought. Her eyes instantly welled up with tears, confusing the girl behind the counter. We have no idea how the girl knew my name. Melissa and I each took one of the English coins and have been carrying them around with us ever since. We later noticed that the date on Melissa’s coin is 1992 – the year she first met David. A couple of days later, Melissa talked with David’s wife, Phoebe, by phone. After hearing about all she and David had been through over the last few months, Melissa decided to share her story about hearing from David at the sandwich shop. Phoebe loved her story and even had a story of her own to share. Reading stories like these are so helpful and healing especially when dealing with grief and loss. I know I felt better rereading it this morning. Regardless of what you believe, it’s clear that there’s more to our physical existence than meets the eye don’t you think? What kinds of signs have you received from loved ones who have passed on? I’d love to read your stories . This week’s video is an interview with Dr. Eben Alexander, the neurosurgeon who had a near death experience that changed his view of life after death. You can watch it, here.